Have bare spots in your grass? 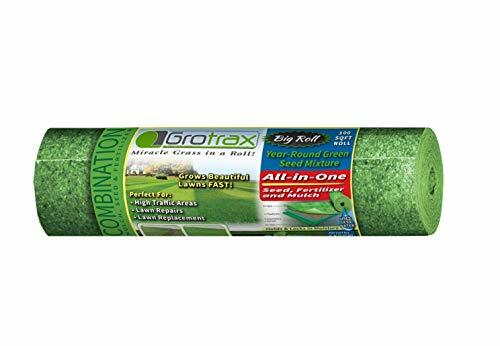 With Grotrax, you just roll, water, and watch it grow! * Grows 3x Faster Than Grass Seed * Bio Fabric Prevents Seeds from Washing Away * Cheaper, Easier, and Lighter than Traditional Sod * Bio Fabric Holds 6x Times its Weight in Water * Turf Quality Lawn in Weeks with No Mess * Perfect for Sun, Shade and Slopes * Nonperishable, Lightweight, Easy to Transport! * Each roll contains 100 square feet of Grotrax. Grotrax Patch n Repair features the "Year-Round Green Mixture", which includes tall, fine and chewing fescue grasses, together with a unique combination of perennial rye and Kentucky blue. This combination ensures success in a wide variety of situations. Whether shaded or sunny, warm or cold, our high quality, concentrated year-round green mixture quickly germinates to create an attractive turf with excellent color, density and wear tolerance. It fights weed invasion and is disease resistant. It is an excellent all-round choice! Simply roll, water and watch it grow! If you have any questions about this product by Grotrax, contact us by completing and submitting the form below. If you are looking for a specif part number, please include it with your message.